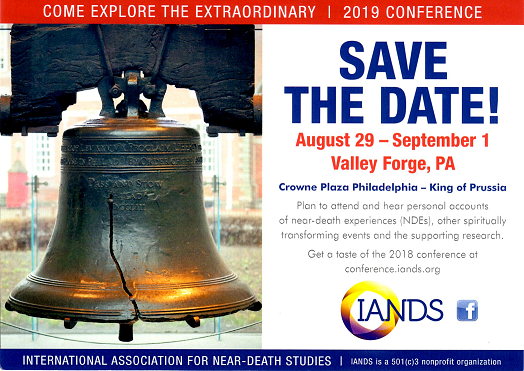 Join IANDS as a valued member. Donate money directly to IANDS. You may contribute any amount you like right now with a credit card. Consider making a donation to IANDS in your will or make a charitable gift to IANDS through a planned gift. Contribute on an ongoing basis through our Light the Way giving program. Go first to our partner, igive.com. Then select IANDS as the charity or "cause" to whom you want a commission sent, and then select your usual merchant from this partner's list of merchants. Your purchase will not cost you more, but IANDS will receive a donation. Volunteer your skills and time. Commit to getting new members. Donate stamps, office paper, money, NDE videos, blank videotapes, or a tape reproduction machine. Develop or obtain a mailing list of people possibly interested in NDEs for the office. This could be from another organization with which you are associated, or from people you have met. Provide the office with any personal contacts you have who might be willing to financially assist or endow IANDS. Sponsor an individual project. We have a list of projects that need specific funding. You could choose one and donate materials or resources for that specific project. This could be donated in memory of someone and we will provide special recognition of the person. Make a recommendation for committee positions and/or special projects. U.S. citizens can get extremely favorable tax treatment by donating to IANDS, since it is a non-profit organization (501-c(3)). For example, gifts of appreciated stock, etc. can greatly reduce a U.S. citizen's tax burden.